Sometimes it is easy to jump to negative conclusions. Thoughts or statements such as, “He didn’t call me after our date, so clearly he is not interested”, “She was quiet at dinner, therefore she is obviously mad at me”, and “He knows I hate it when he gets drinks after work” are all examples of assumptions that people make every day in their relationships. However, making assumptions about those you care about can be toxic. First impressions of a situation don’t necessarily always correlate with the facts; it is impossible to know someone else’s experience. Assuming you know how another person thinks and feels is rarely beneficial because you are only seeing things from your unique perspective. When you do this, you are essentially deciding your viewpoint is a fact when you don’t have all the information. These negative assumptions then elicit responses of anger, sadness, conflict, or withdrawal from both parties, negatively impacting all those involved. 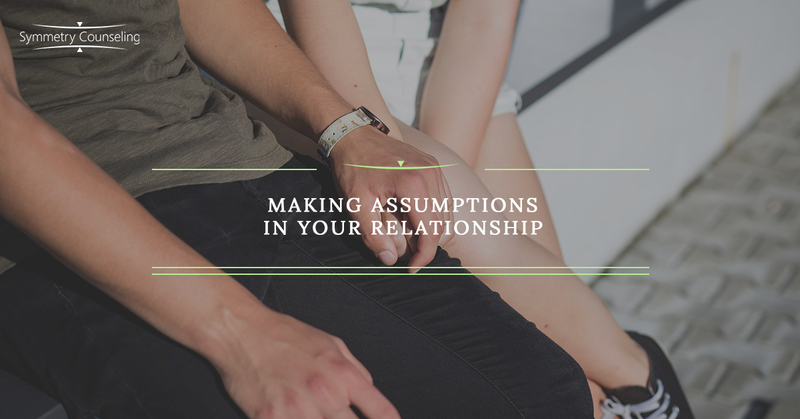 Assumptions don’t give your partner the opportunity to share their side of the story and leave one or both of you feeling disregarded, upset, and misunderstood. Rather than engaging in this toxic process in your relationships, try using the three tactics below to obtain your partner’s point of view. Ask yourself, “Do I have the facts or am I making an assumption based only on my perspective?” Rather than interpret or guess what your partner’s intentions are, take that next step to share your experience and ask your partner about theirs. Keep that line of communication open between you and your partner and gather the facts before making assumptions. Asking for your partner’s perspective reduces the chances of misunderstanding and clarifies your partner’s needs and desires. In your own words, repeat back to your partner what you heard from him or her. Whether you are making plans, making a big decision, or are communicating feelings and emotions, make sure you fully understand their perspective. If you feel something they said is unclear, ask for clarification until you are both on the same page. Once you are on the same page, you are more likely to listen to and compromise with your partner. If you have made assumptions that caused you to be hurtful or disrespectful to your partner, own up to your actions. Don’t minimize your assumptions, and challenge yourself to apologize for hurting your partner and jumping to conclusions. By taking responsibility for your assumptions, you are becoming more aware of how often you make them and allowing your partner the opportunity to take responsibility for their part as well. This will leave you both feeling more understood and important to the other. If you feel you are making assumptions about your relationships and would like support, it may be useful to connect with a therapist. Contact Symmetry Counseling at 312-578-9990 to set up an appointment with one of our very skilled therapists.